Just like the end of the school year, Better Speech and Hearing Month is just around the corner (not that I am counting 😉). I have several goodies up my sleeve for you but let's start with this fun, no prep freebie. 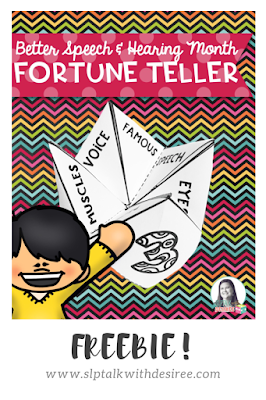 You can download this SLP Fortune Teller here or click on the image below. The directions are built in with visuals to help you along the way. Have fun! P.S. When you download, make sure that you click "Follow" beside the green star (if you haven't already) so you will be the first to know about new uploads that come your way.